Using our healthy OILS will Dissolve, Lift, and Replace soiled oils with Hydrating and Nourishing Oils! And the Hydrosols in SPLASH will hydrate, balance your skin's Ph, and heal with amazing Plant Medicine! Oil: Apricot Kernel (Prunus Armeniaca), Macadamia Nut (Macadamia integrifolia), Jojoba (Simmondsia chinensis), Sweet Almond (Prunus dulcis), Hazelnut (Corylus avellana) oils; Palmarosa (Cymbopogon martini), Lemon (Citrus limon), Bois de Rose (Aniba roseodora) and Styrax Benzoin (Styrax tonkinensis) essential oils. 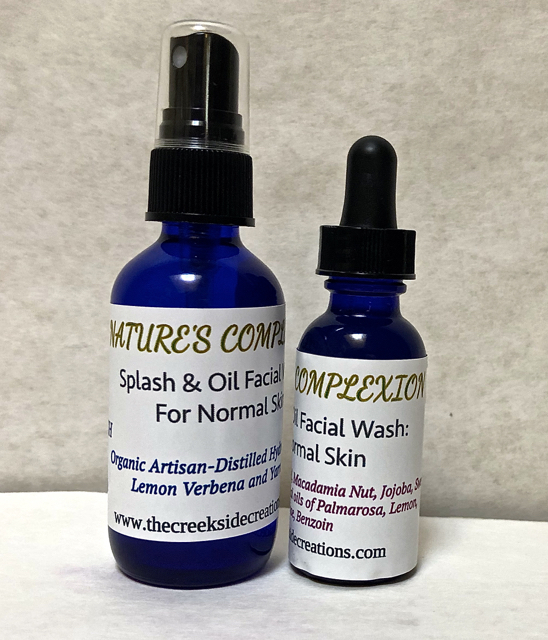 Click the button below to add the NATURE'S COMPLEXION © Splash and Oil Facial Wash: for Normal Skin to your wish list.